On Thursday, March 29, 2018, Leo DelZotto, Andrea DelZotto, Gian DelZotto, Joanne Bin & Stephen Upton joined members of the faculty, staff and students of the George Brown College Centre for Construction & Engineering Technologies (CCET) Program in a special event. It was with great pride that we presented a cheque for $30,000 on behalf of the BOLT Charitable Foundation to help fund scholarships awarded to students pursuing careers in the construction industry. The BOLT Charitable Foundation is supported through fundraising events aided by industry and trade partners and through Tridel’s internal fundraising, these initiatives help BOLT achieve it’s goal of investing in youth and the future of our industry. 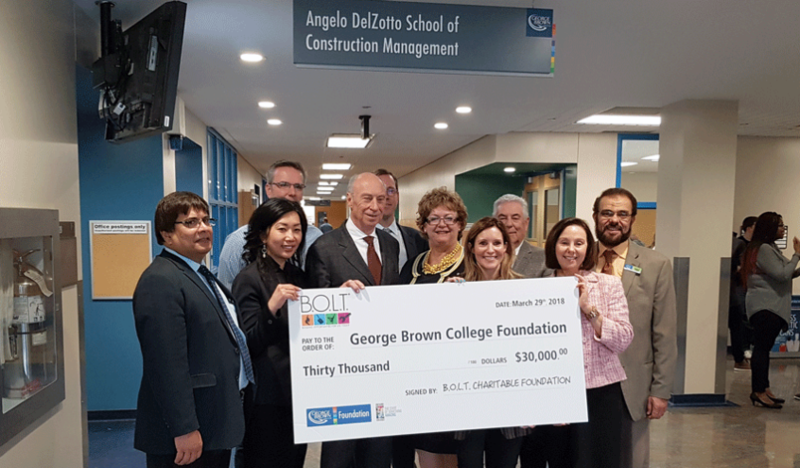 This marks the 8th year in which the BOLT Program has supported scholarships for eligible students enrolled in the George Brown College Centre for Construction & Engineering Technologies Program.